Susan started her nursing career at the City Hospital on the 1st January 1898 aged 24. There does not seem to be any record or recollection of what she did until then. She was trained to deal with fevers and infectious diseases and qualified 3 years later on 31st December 1900. Her certificate of competence is signed by the Medical Officer of Health and three other officials. On the 1st April 1901 she entered the School of Nursing in the Royal Infirmary of Edinburgh and 3 years later received a certificate detailing the duties she had performed and the following testimonial. “She proved a very quite and kindly nurse, capable, thorough in her work and excellent in her management of helpless patients”. 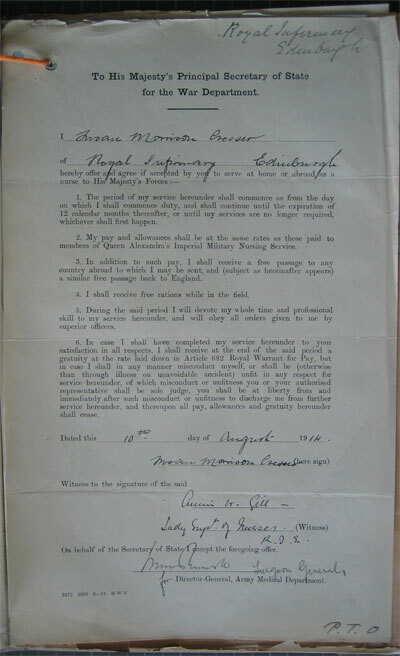 Then on 30th July 1904 she received 6 months training as a District Nurse and was appointed to the Larkhall (near Glasgow) Nursing Association and served there from 27th February 1905 till 15th may 1919. 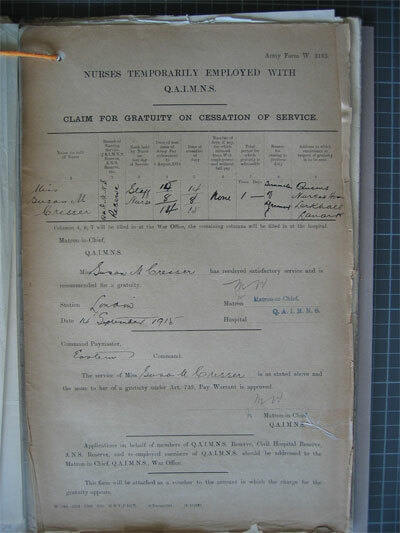 On her retirement from Larkhall she received a certificate from Queen Victoria’s Institute for Nurses that during her period of service as a Queen’s Nurse her work had been very good and her conduct had been excellent. During her service at Larkhall she received a letter dated 7th August 1914 from the Lady Superintendent of Nurses at the Royal Infirmary in Edinburgh informing her that she had been selected for service with the Army at home or abroad. There is a list of Camp Kit and Active Service Equipment which all members of Queen Alexandra’s Imperial Military Nursing Service had to provide themselves. There is also a list of suppliers of such equipment. Harrods, Army & Navy stores amongst others still in business. One name has been added in ink. Gale & Polden and it is in the handwriting of her brother in law John Macpherson. Susan has put a price against 1 looking glass 1/6, 1 flat iron 10d, 1 Securem tent pole strap 5/-. There are 22 items in all ranging from a Portable Camp Bedstead to a cup and saucer. She was very soon in France. 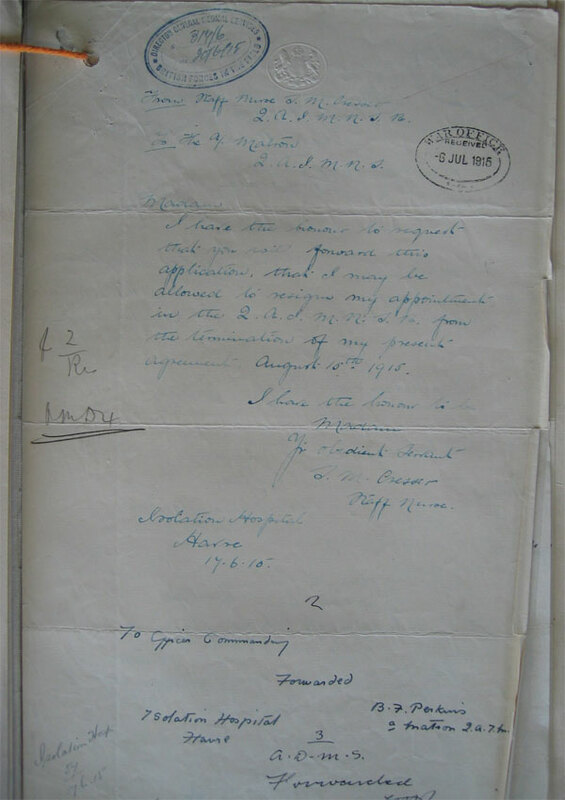 There is a letter dated 11th December 1914 from Aunty Susan on active service in France. It is thought that she was in France for a year and we know that she took part in the retreat from Mons. She was awarded the following medals: - 1. British War Medal. 2. First World War Medal, with Mons Star to indicate that she took part in the retreat from Mons. 3. Victory Medal 1914/1918. She died in 1954 and judging by her Will she had a large number of friends to whom she left varying small sums of money. Tupman and McVittie are names that I recall and many members of the Cresser family are also mentioned. She also had a life rent of the eastern half or division of the Garret Storey of 165 Rose Street in Edinburgh. The remainder of this was left to her house keeper.